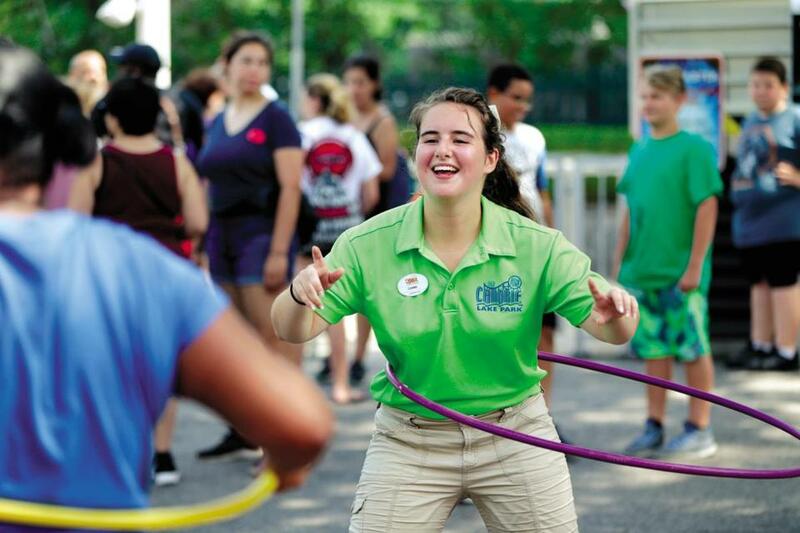 Samantha Chiodi gets to use hula hoops at her summer job at Canobie Lake Park. She is part of the Fun Squad at the park. 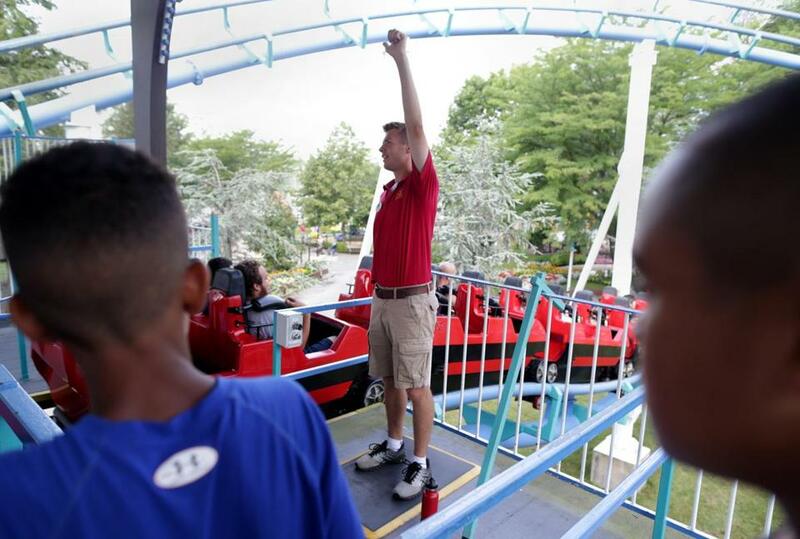 SALEM, N.H. — Faced with hundreds of jobs to fill, and a shortage of workers to fill them, Canobie Lake Park bumped up its recruiting efforts this summer, taking out more ads and offering employees unlimited access to the amusement park during the week. Canobie Lake also opened up more jobs to a group of workers it had previously limited: 15-year-olds. These younger teens come with more restrictions on the hours they can work, but park supervisors had little choice, given how many older teens are getting snapped up by other businesses, said brand manager Chris Nicoli. After years of falling employment rates, the share of teens with jobs has been rising in a historically tight labor market where the number of job openings exceeded the number of job seekers for the first time on record this year. From May to July this year, hiring of 16-to-19-year-olds increased nearly 8 percent nationwide over last summer — the highest number of teen jobs added since 2012, according to the outplacement firm Challenger, Gray & Christmas. From clam shacks and fast food joints to banks and manufacturers that don’t traditionally hire teens, companies are casting an ever-wider net. “It’s only when the labor market started to scream for employees in the low-wage sector that young people started getting jobs,” said Neil Sullivan, executive director of the Boston Private Industry Council, a nonprofit focused on youth employment. In 2016 and 2017, 32 percent of Massachusetts 16-to-19-year-olds had summer or after-school jobs, up from 30 percent in 2014-2015 and 27 percent in 2012-2013, according to Bureau of Labor Statistics data. This is still below what it was before the recession, and far lower than in 1999-2000, when half of teens worked. But with the labor crunch continuing — especially on Cape Cod and in other tourist hot spots due to difficulties getting foreign worker visas — companies have started to more actively recruit, and hire, teens. In March, McDonald’s upped its tuition reimbursement program from $700 to $2,500 a year for crew members, and now requires workers to be on the job for only 90 days to be eligible, instead of nine months — an especially attractive benefit for young people. Bob Broughton, director of operations for 13 McDonald’s restaurants in Greater Boston, has seen a significant increase in applications from teenagers this year. The tuition assistance helps, he said, especially if their parents know about it, as does the fact that the restaurants started accepting online applications last year, which makes the process more appealing to young people who are more comfortable communicating digitally. A third of teens who were employed last July worked in restaurants, hotels, and other so-called accommodation and food services jobs, the only major industry that had more teen workers than in July 2000, with a nearly 20 percent increase, according to the Pew Research Center. Retail, on the other hand, another major teen employer, had a 35 percent drop in teen workers in July 2017 compared to July 2000 — despite a 4 percent increase in retail workers overall during that time period. But lately, even companies that don’t traditionally hire teens have started reaching out to them. This summer, Federal Home Loan Bank of Boston hired a 17-year-old from Hyde Park for a six-week internship. The bank, which provides funds for financial institutions, hopes to expand the program next summer as part of a long-term strategy to attract more workers to the industry, said human resources manager Brenda Kirouac. “We have historically had a challenge attracting the younger generation,” she said of banks and financial service firms. It was only 18 years ago that nearly half of Massachusetts teens were working, but then that number started dropping. When the recession took hold, in 2008, teen employment was at 37 percent. Workers of all ages experienced a drop in employment during the economic downturn, but the decline was sharpest among teens, according to the Center for Labor Markets and Policy at Drexel University in Philadelphia. And while the overall labor market has largely recovered, teen employment has not kept pace. Economists note a number of reasons for the decline: more immigrants and older people willing to do entry-level jobs, and employers’ preference for adults to do them; fewer such jobs to come by as automation and online shopping grow; and rising minimum wages causing employers to think twice about hiring inexperienced workers. College — and the academic work and volunteering that young people undertake to help them get in — is also taking priority over work. But missing out on work experience early on can have serious consequences. Kids who work during high school have a higher probability of enrolling in and completing college, especially boys, said Drexel economist Paul Harrington. They also have higher earnings potential and are better at saving money, he said. 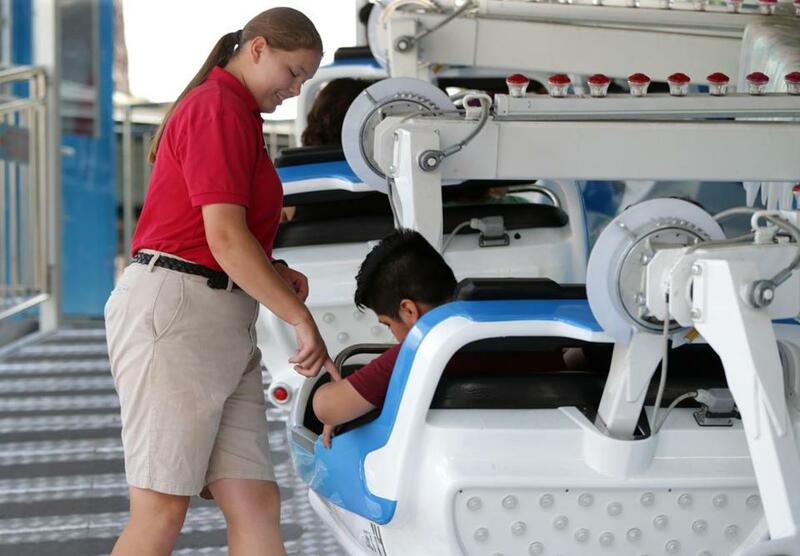 Marie Suleski, 17, checks a riders on the Ice Jet Ride at her summer job at Canobie Lake Park. Despite stereotypes of entitled teens who don’t want to work, a lot of them actually do want to. When the number of teens who quit looking for jobs is taken into account, along with unemployed youth and those working part time who would rather be full time, 31 percent of the teen labor force was considered underutilized in the summer months of 2016-2017 — the highest rate of any age group, according to the Drexel analysis. In Massachusetts, one of 11 states where teens are entitled to the same minimum wage as adults, some employers started cutting back on hiring teens as the minimum wage rose to $11 an hour, and more are likely to do so as it rises to $15 by 2023. Indeed, several studies have found that minimum wage increases have a negative impact on teen employment. A focus on preparing students for MCAS tests over the past decade and a half also unintentionally squeezed out more career-oriented courses at high schools, which meant teens were less prepared to work, said Sullivan, of the Boston Private Industry Council. But the increased need for technical skills in today’s economy, as well as the skyrocketing cost of college, is putting a renewed emphasis on job readiness, he said. The PIC, as it is known, has seen an uptick in hiring among those 18 and over in the last two years, and this could trickle down to younger teens as schools do more to prepare students to enter the workforce and employers get used to hiring teenagers again. This is already happening at Canobie Lake Park, where the expanded crew of 15-year-olds serve as greeters, and 16- and 17-year-olds mainly work in rides and games. Samantha Chiodi, 19, who started at the park at age 15, is part of the “fun squad,” hula hooping and dancing for guests around the park, as well as dressing up as Molly the Mouse. Working at Canobie Lake has helped her “blossom and be who I am,” she said, and also helps pay for costs at Southern New Hampshire University. Jack Larcome, 17, working to launch the Canobie Cork Screw ride at his summer job at Canobie Lake Park.